· Comptroller Munger warns of $6.2 billion price for budget gridlock. In a report to Illinois residents on Tuesday, February 2, the Illinois Comptroller projected that Illinois will fall $6.2 billion further behind on its “unpaid bills” in FY16 unless a solution to the budget crisis can be found. Leslie Munger’s office oversees the cash flows of Illinois state government, particularly the “general funds” cash flows that are at the heart of the current crisis. Many of these cash flows are related to State-financed health care, education, and other government services classified as essential. In her statement, Comptroller Munger pointed out that Illinois has entered the eighth month of fiscal year 2016 (FY16) without a balanced budget to control State spending. During the course of this fiscal year, based upon current cash flows, general funds tax receipts are falling approximately $5.0 billion short of the monies that came in last year. At the same time, mandated State spending – even without a budget – means that cash is going out at a rate approximately $1.2 billion ahead of last year. The combination of these two categories, cash in and cash out, adds up to Munger’s $6.2 billion figure. State of Illinois spending has actually sped up in FY16 over FY15 because of the existence of a network of interlocked court decisions, consent decrees, and continuing appropriations that bind Illinois and privilege a series of categories of social spending above the statutory appropriations powers of the State. Health care spending, particularly Medicaid spending, makes up a large percentage of this cash push. · Illinois flood damage being assessed. Officials with the Federal Emergency Management Agency (FEMA) are getting ready to conduct damage assessments in sections of southern Illinois hit hard by the flooding that began in late December. Illinois must post at least $18 million in storm-related damage to homes and businesses to be eligible for certain federal funds. The assessors will look at locations within Alexander County, centering on far-southern Cairo, and historic Randolph County, centering on Chester. Both counties border the lower Mississippi River, which was swelled by a record fall of rain and sleet on southern Illinois and much of Missouri in the days immediately following Christmas. The Show-Me State, across the Mississippi from Cairo and Chester, has already been approved for federal disaster relief funds. · General Assembly budget arm looks at State cash flow picture. The monthly report by the Commission on Government Forecasting and Accountability (COGFA), the General Assembly’s budget-watchdog office, was published on Tuesday, February 2. State general funds revenues continued to fall in January 2016. Particular weakness was posted in January 2016 in State personal income tax revenues, with receipts of $1.832 billion in January 2016 as opposed to $2,012 billion in January 2015. The decline of $180 million had special significance because, for the first time, personal income taxes for both year-over-year months were based on an individual income tax rate of 3.75%. The former 5.0% individual income tax rate that had been enacted by the Democrats in January 2011, and charged to Illinois taxpayers in calendar years 2011 through 2014, fell off the tax table and was partly rolled back on January 1, 2015. The corporate income tax rate was simultaneously rolled back to 5.25% (7.75%, with the add-on of an additional 2.5% levy imposed by the corporate personal property replacement tax). Despite this element of continuity in these January year-over-year comparisons, State gross revenues from individual income taxes dropped by 8.9% in January 2016 as opposed to the previous year. The negative revenue numbers were blamed on the dismal overall economic and jobs picture here in Illinois. After various additional variables were added to the budget spreadsheet, Illinois cash flow allocated to general funds uses fell $250 million short in January 2016 of the level of cash flow coming in during January 2015. The COGFA report reinforces and provides additional evidence in favor of the cash-flow picture depicted by Illinois Comptroller Munger this week. The combination of month-to-month cash flow deficits tracked by COGFA is likely to compile a total deficit of approximately $6.2 billion by the end of FY16. · $725 million borrowed by CPS at junk-bond interest rates. The debt sale was announced on Wednesday, February 3. Bond buyers told the Wall Street Journal they had been able to ask for, and get, 8.5% interest rates from the struggling school system. The New York-based newspaper commented that “the district was forced to pay rates rarely seen in the municipal bond market in recent years.” Although the financially beleaguered Chicago Public Schools was able to borrow money this week, their credit rating (which has been cut far below “junk bond” level) meant that Chicago taxpayers will have to pay interest rates that reflect substantial risk of default. · New law will ban the sale of e-cigarettes to children under the age of 18. The new Illinois law parallels the ban in place for many years on the sale of conventional cigarettes and other tobacco products to children. While the new law includes a wide variety of actual and hypothetical nicotine delivery devices, it is specifically aimed at the sale of e-cigarettes and vaporizers. Possession of tobacco by children under the age of 18 is already illegal, and this new law (effective June 1, 2016) will extend the existing ban to cover newly-invented vape and e-cigarette products. 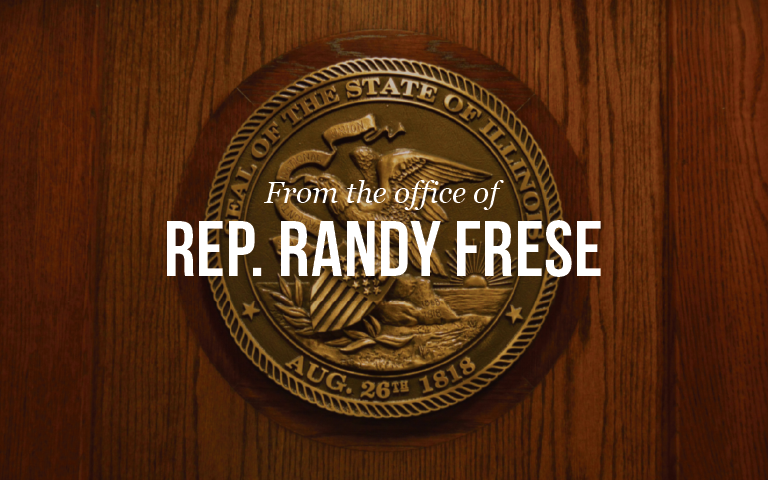 The bill (SB 32) creating this new law was enacted by the House and Senate in 2015, and was signed by Governor Rauner on Friday, January 29 as P.A. 99-496. Under the new law, the retail sale of alternative nicotine products to a juvenile, and the possession of these products by a juvenile, will become a petty offense punishable by a schedule of fines. For the retailer the statutory fine for a first offense will be $200, and for a juvenile the statutory fine for a first offense will be $50 with a possible additional requirement that the juvenile carry out an imposed sentence of community service. Repeat offenses, by any party, will draw a pattern of increasing monetary penalties. P.A. 99-496 will go into effect on June 1, 2016. · Rauner sets up public-private partnership to create jobs. The new Illinois Business and Economic Development Corporation(ILBEDC) was created by executive order on Wednesday, February 3. The new Corporation has applied for 501(c)(3) status as a federal nonprofit. As the new firm goes into full operation, it is expected to assume some of the operational functions that have been carried out by the Department of Commerce and Economic Opportunity (DCEO). A list of states that includes Florida, Indiana, Michigan, Minnesota, Missouri, New York, North Carolina, Ohio, Pennsylvania, Texas, and Wisconsin have created public-private partnerships (3-Ps) as weapons in the overall arsenal of state promotion. Many states have seen good results from this strategy. In 2005, for example, Indiana established a new Indiana Economic Development Corporation. The new Hoosier economic development arm sold the “Crossroads of America” as a good place to create Midwestern jobs. The Indiana corporation reported that in the year after startup, it saw a 54% increase in job-creating competitive projects sited in Indiana, and a 30% reduction in incentive dollars spent by Indianapolis to create each new individual job. In the highly competitive field of state incentives for job creation, many states are finding that it is becoming increasingly essential to operate this level of enterprise in a results-oriented manner. 3-P entities such as the new ILBEDC are not limited by the constraints placed upon purely public-sector agencies that must carry out their operations in rigid compliance with the state Personnel Code. · White House sets date of President’s visit for Wednesday, February 10. President Obama is expected to address the Illinois General Assembly at the State Capitol in Springfield, where he served until 2004 as a member of the state Senate. House Republican Leader Jim Durkin issued a statement welcoming the President’s visit. Security is expected to be extremely tight for the presidential travel to Springfield. President Obama’s return to Springfield comes nine years after his televised announcement at the Old State Capitol in February 2007, where Obama declared his candidacy for President. At the time, Obama was an elected U.S. Senator from Illinois. Prior to holding federal office, Obama had represented a slice of Chicago’s South Side in the Illinois State Senate from January 1997 until the end of 2004. His Illinois state legislative district was adjacent to the projected location of his future presidential library in Washington Park, Chicago. · Governor Rauner, legislators call for reforms to State procurement process. After a year of working through and carefully evaluating Illinois’ onerous procurement process, a comprehensive reform package developed collaboratively by the Rauner administration, agency heads, legislative leaders and major stakeholders has emerged that has the potential to realize significant savings for Illinois taxpayers. The legislative package, which will be filed concurrently in both the House and Senate by Rep. Dan Brady (R, Normal) and Sen. Pamela Althoff (R, McHenry) respectively, was unveiled during a press conference at the Illinois State Fairgrounds 4H building. Governor Rauner believes streamlining the procurement process could save Illinois taxpayers as much as $514 million per year. The reform package would provide both the State as well as individual agencies increased flexibility and efficiencies in purchasing and procurement thus increasing the opportunities for savings. This includes the creation of a pool of pre-qualified vendors for supplies and services, as well as allowing State and local governments to enter into purchasing consortiums in hopes of leveraging buying power. In addition, it would carve out procurement code exemptions for an array of instances including service contracts, trade shows and units of higher education. The procurement reform package is included in HB 4644, filed in the House on Tuesday, February 2 by Rep. Dan Brady. House Republicans have previously called for Illinois procurement reform. Rep. Mark Batinick, for example, introduced legislation in 2015 paralleling a key feature of HB 4644. Batinick’s HB 4215 calls for changes in existing law to free up Illinois public universities from the Procurement Code.